Objective: To judge the female progesterone receptor proteins in the biological behavior of endometrial carcinoma tissue, for the diagnosis, treatment and prognosis of endometrial carcinoma. Methods: In October 2012 to 2012 years in our hospital's collection of 79 example intrauterine membrane carcinoma specimens, 48 cases of normal endometrium and 51 cases of atypical hyperplasia of endometrium specimens were collected as specimens for analysis, using immunohistochemical method to three kinds of tested specimens of female progesterone receptor protein expression, analysis of the female progesterone receptor protein in normal endometrium, atypical hyperplasia of endometrium and endometrial carcinoma tissue expression differences of endometrial carcinoma tissues and research the female progesterone receptor protein expression and clinical pathological characteristics and treatment outcome of correlation. Results: The G1 stage endometrial cancer patients with female progesterone receptor protein positive expression rate (21.16%) is significantly higher than grade G3, G3 endometrial cancer of the female progesterone receptor protein positive expression rate (34.78% and 30.77%), compared with significant difference (P<0.05); I period surgical pathology in patients with endometrial cancer of the female progesterone receptor protein positive expression rate (51.51%) was significantly higher than that of IIIV surgical pathology in patients with endometrial cancer of the female progesterone receptor protein positive expression rate (37.50%, 29.41% and 46.13%), compared with significant difference (P<0.05); Positive expression in patients with postoperative cumulative survival rate (86.67%) is significantly higher than the negative expression in patients with postoperative cumulative survival rate (71.05%), compared with significant difference (χ2=1.556, P<0.05). Conclusion: Positive protein expression of estrogen and progesterone receptors may be served as the reference indicator for prognostic observation of treatment for patients with endometrial cancer. Endometrial cancer, accounting for about 30% of the malignant tumors in female reproductive system, is a kind of common and multiple-onset epithelial malignant tumors in reproductive system of females in the world, and its incidence rate in the world remains increasing year by year . The exact pathogenesis of endometrial cancer remains unclear, which is possibly correlated with various factors, such as obesity, stimulation of estrogen and progestogen, hypertension, inheritance, etc. Thus, estrogen and progesterone receptors may be important to the occurrence and development of endometrial cancer . But, few literatures have reported the protein expression patterns of estrogen and progesterone receptors in endometrial cancer tissues and the correlation with prognosis . Hence, in this study, we collected the relevant paraffin samples of endometrium from patients in this hospital to retrospectively analyse the protein expression patterns of estrogen and progesterone receptors in endometrial cancer tissues. Based on the results, we could evaluate the biological behaviors of estrogen and progesterone receptors in endometrial cancer tissues to provide theoretical reference for diagnosis, treatment and prognosis of endometrial cancer. This study had been approved by the Ethics Committee of the hospital, and patients and their family had signed the written informed consent. Between October 2012 and 2013, we collected 79 cases of endometrial cancer, 48 of normal endometrium and 51 of atypical hyperplasia endometrium as the samples for retrospective analysis. Seventy-nine surgical paraffin samples of patients who were admitted to the hospital between October 2012 and 2013 were served as the endometrial cancer samples, and the age of patients ranged from 36 to 76 years old with an average of (54.5 ± 4.7) years; patients that were included in this study were all diagnosed as primary cases without the history of radiotherapy, chemotherapy or hormonotherapy. Fifty-one cases of atypical hyperplasia endometrium were obtained from patients who were admitted to this hospital for treatment of gynecological diseases between October 2012 and 2013, and the age of patients ranged from 38 to 77 years with an average of (55.9 ± 4.6) years. Forty-eight cases of normal endometrium were obtained from people who received the reproductive examination in this hospital between October 2012 and 2013, and the age of patients ranged from 41 to 75 years with an average of (56.7 ± 5.1) years. All samples were fixed in 10% formic acid, embedded using paraffin and verified through explicit pathological examination. No statistically significant differences were identified in comparison of patient’s age among three groups (P>0.05), suggesting that the data were comparable. Immunohistochemistry staining: Firstly, all paraffin samples for test were sliced into 4μm sections and dewaxed in dimethylbenzene. Then 100% ethanol and PBS (Phosphate Buffer Saline) was used for hydration. Sections were placed into 0.01 M citrate buffer solution for antigen retrieval followed by staining using hematoxylin. After staining was successfully performed, sections were hydrated and sealed followed by microscopic examination under a microscope [4,5]. After immunohistochemistry staining, sections were placed under the microscope for cell count in 5 randomly selected visions (400X). In each vision, we selected 200 tissue cells to calculate the quantity of positive cells. Positive staining cells<5% were considered as negative protein expression of estrogen and progesterone receptors, and positive staining cells ≥ 5% as positive protein expression of estrogen and progesterone receptors . Pathological grading of endometrial cancer: Pathological grades of endometrial cancer reflected the differentiation degrees of endometrial cancer. In this study, according to the criteria of historical grade of WHO (World Health Organization), we divided the endometrial cancer into 3 pathological grades: G1 for high differentiation; G2 for moderate differentiation; G3 for poor differentiation . Surgery pathological stage of endometrial cancer: The surgery pathological stages of endometrial cancer indicted the biological characteristics of endometrial cancer, such as the growth rate of tumor, and metastasis, migration and progression of tumors, which were of great significance for guiding the prognosis evaluation of surgery. In this study, endometrial cancer was divided according to the International Federation of Gynecology and Obstetrics (FIGO) into 4 surgery pathological stages: Stage I for low growth rate and/or poor metastasis, migration and spread of tumors; Stage II for moderate growth rate and/or moderate metastasis, migration and spread of tumors; Stage III for relatively high growth rate and/or relatively high metastasis, migration and spread of tumors; Stage IV for high growth rate and/or high metastasis, migration and spread of tumors . SPSS 19.0 software was applied for statistical processing of data. Measurement data were presented as percentage. Chisquare test was applied for the comparison of positive expression rate of estrogen and progesterone receptor in all kinds of endometrial tissues and correlation analysis. Kaplan- Meier curves were employed in the univariate survival analysis for the prognoses of patients with positive or negative protein expression of estrogen and progesterone receptor. P<0.05 was set as the significant level of this study. After immunohistochemistry staining, estrogen and progesterone receptor proteins in the endometrial tissues were presented as sandy or brown granules, and most of them could be found in cell nuclei. From the section, we found that cell membrane was colored (Figures 1-3). In Figures 1-3, high positive rate (56.96%) was identified in endometrial cancer tissues, significantly higher than the normal endometrium (27.08%) and endometrial hyperplasia (39.22%), and the differences had statistical significance (P<0.05, Figure 1 and Table 1). Figure 1: Female progesterone receptor protein expression in normal endometrial tissue (immunohistochemical staining). Figure 2: Female progesterone receptor protein expression in endometrial carcinoma tissue (immunohistochemical staining). Figure 3: Female progesterone receptor protein expression in the atypical endometrial hyperplasia endometrium tissue (immunohistochemical staining). Table 1. Female progesterone receptor protein in normal endometrium and hyperplasia of endometrium and endometrial carcinoma tissue of the expression. The positive protein expression of estrogen and progesterone receptors was closely correlated with the pathological grades of endometrial cancer. In patients with G1 endometrial cancer, the positive expression rate of estrogen and progesterone receptors (21.16%) was significantly lower than patients with G2 (34.78%) and G3 (30.77%) endometrial cancer, and the differences were statistically significant (P<0.05). The positive protein expression of estrogen and progesterone receptors was closely correlated with the surgery pathological grades of endometrial cancer. In patients in Stage I endometrial cancer, the positive protein expression rate of estrogen and progesterone receptors (51.51%) was significantly higher than the patients in Stage II (37.50%), Stage III (29.41%) and Stage IV (46.13%) endometrial cancer, and the differences were statistically significant (P<0.05). Age of onset, menopause stage and tumor type were not significantly correlated with the positive protein expression of estrogen and progesterone receptors. In comparison of the positive protein expression rate of estrogen and progesterone receptors, there was no significant difference between endometrial cancer patients aged not above 50 years (42.85%) and those aged above 50 years (43.10%, P>0.05); no significant difference was detected in comparison of the positive protein expression rate of estrogen and progesterone receptors between endometrial cancer patients before menopause (42.85%) and those aged above 50 years (43.14, P>0.05); there were no significant differences in comparisons of the positive protein expression rate of estrogen and progesterone receptors among endometrial adenocarcinoma patients (47.06%), serous adenocarcinoma patients (45.45%), clear cell carcinoma patients (25.00%) and differentiated epithelial carcinoma patients (33.33%, P>0.05, Table 2). Table 2. Female progesterone receptor protein positive expression and the clinical pathological characteristics of endometrial carcinoma correlation tables. In 79 endometrial cancer patients, 68 received the follow-up and 11 lost to follow-up before October 2016. In 68 patients who received the follow-up, postoperative 3-year survival rate was 77.94% (53/68); among 15 patients who died after operation, the death of 14 patients was caused by endometrial cancer and 1 by myocardial infarction. In 68 patients, positive protein expression of estrogen and progesterone receptors was identified in 30 patients, and negative protein expression in 38 patients; we also carried out chi-square test in the comparison of prognosis (accumulated survival rate) between patients with positive protein expression of estrogen and progesterone receptors and those with negative protein expression (Figure 3), and established the Kaplan-Meier curves to perform univariate survival analysis for the prognoses of patients with positive protein expression or negative protein expression of estrogen and progesterone receptors (Figure 4). The results showed that the accumulated survival rate of patients with positive expression (86.67%) was significantly higher than the patients with negative expression (71.05%), and the difference had statistical significance (χ2=1.556, P<0.05, Table 3). 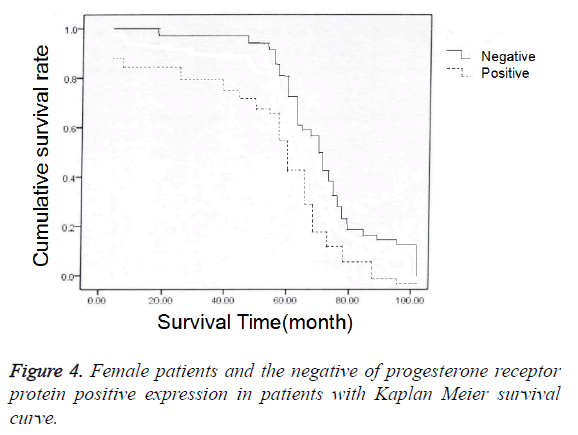 Figure 4: Female patients and the negative of progesterone receptor protein positive expression in patients with Kaplan Meier survival curve. Table 3. Female patients with progesterone receptor protein positive expression and the prognosis of patients with negative expression of comparison. As the most common female malignant tumor, endometrial cancer, accounting for 7.3% of general female malignant tumors in incidence rate, has become the 4th female malignant tumor secondary to breast cancer, lung cancer and colorectal cancer . The onset of endometrial cancer is seen not only in women of child-bearing age, but also in those after menopause; the median age of onset is about 63 years old, and 30% of patients experience the onset before menopause . In the 20th century, Bokhman firstly put forward the differentiation concept of endometrial cancer, in which the onset of endometrial cancer is divided into the estrogen-dependent and estrogen-independent types according to the correlation between onset and estrogen and progesterone, and this concept has been gradually recognized by many researchers . Based on the differentiation concept of endometrial cancer, we can infer that the protein expression of estrogen and progesterone is closely correlated with the occurrence and development of endometrial cancer, but there remains no explicit conclusion for the specific mechanism. Many scholars believe that longterm, persistent and abnormal high protein expression of estrogen and progesterone receptors results in the intrauterine resistance to estrogen and progesterone, thus causing the proliferation and repair of endometrial stroma and gland, finally leading to the progression of atypical hyperplasia of endometrium into endometrial cancer . Currently, few literatures have reported the expression patterns of estrogen and progesterone receptors in endometrial cancer tissues and the correlation with prognosis. Hence, in this study, we collected the relevant paraffin samples of endometrium from patients in this hospital to retrospectively analyse the expression patterns of estrogen and progesterone receptors in endometrial cancer tissues. Based on the results, we could evaluate the biological behaviors of estrogen and progesterone receptors in endometrial cancer tissues to provide theoretical reference for diagnosis, treatment and prognosis of endometrial cancer. Results of this study showed that a high positive protein expression rate of estrogen and progesterone receptors (59.96%) was identified in the endometrial cancer tissues, which was significantly higher than the normal endometrial tissues (27.08%) and endometrial hyperplasia tissues (39.22%), and the differences had statistical significance (P<0.05), suggesting that protein expression of estrogen and progesterone receptors is sequentially increased in normal endometrial tissues, atypical endometrial hyperplasia tissues and endometrial cancer tissues. This result suggested that excessive protein expression of estrogen and progesterone receptors can exert certain functions in the occurrence and development of endometrial cancer, which is almost coincident with the research conclusion of Maxwell et al. .
Additionally, as for the correlation between protein expression of estrogen and progesterone receptors and clinical pathological features of endometrial cancer, the positive expression rate of estrogen and progesterone receptors (21.16%) was significantly lower than patients with G2 (34.78%) and G3 (30.77%) endometrial cancer, and the differences were statistically significant (P<0.05). This suggested that the positive protein expression of estrogen and progesterone receptors is closely correlated with the pathological grades of endometrial cancer. This may be attributed by the following reasons: Pathological grades of endometrial cancer can reflect the differentiation degree of endometrial cancer, in which with the progression from G1 to G3, the differentiation degree of endometrial cancer is decreased but the malignancy of biological behaviors is increased, resulting in a decrease in protein expression of estrogen and progesterone receptor against the increase in the pathological grade of endometrial cancer tissues [14,15]. In addition, the positive expression rate of estrogen and progesterone receptors (51.51%) was significantly higher than the patients in Stage II (37.50%), Stage III (29.41%) and Stage IV (46.13%) endometrial cancer, and the differences were statistically significant (P<0.05). This suggested that the positive protein expression of estrogen and progesterone receptors is closely correlated with the surgery pathological grades of endometrial cancer, which may be attributed by the following reasons: Surgery pathological grades of endometrial cancer can reflect the differentiation degree of endometrial cancer, i.e. the growth rate of tumor and metastasis, migration and spread degrees of tumor; however, with the progression in surgery pathological stages, the possibility of metastasis, migration and spread of tumors is increased against the rapidly increased growth rate of endometrial tumor, thus resulting in a decrease in protein expression of estrogen and progesterone receptor against the increase in the pathological grade of endometrial cancer tissues [16,17]. Meanwhile, the results in this study also showed that the accumulated survival rate of patients with positive expression (86.67%) was significantly higher than the patients with negative expression (71.05%), and the difference had statistical significance (χ2=1.556, P<0.05). This suggested that the protein expression of estrogen and progesterone receptors is closely correlated with the surgery prognosis, and a better prognosis of treatment can be attained in patients with positive protein expression of estrogen and progesterone receptors, which is basically coincident with the results of research of Alizadeh et al. . Although the specific mechanism remains unclear and more large-sample studies are required for verification, many studies reported that positive protein expression of estrogen and progesterone receptors can be served as a reference indicator of prognostic observation of treatment for endometrial cancer patients [19,20]. In conclusion, protein expression of estrogen and progesterone receptors is sequentially increased in normal endometrial tissues, atypical endometrial hyperplasia tissues and endometrial cancer tissues, indicating that excessive protein expression of estrogen and progesterone receptors can exert certain functions in the occurrence and development of endometrial cancer. Protein expression of estrogen and progesterone receptor will be increased and decreased respectively with the increase in pathological grades of endometrial cancer tissues and progression in surgery pathological stages, and the prognosis of treatment in patients with a high protein expression of estrogen and progesterone receptors is better than those with a low protein expression, suggesting that positive protein expression of estrogen and progesterone receptors may be served as the reference indicator for prognostic observation of treatment for patients with endometrial cancer. Nai-zhe Z, Cheng W, Qin-ping L. The present status of endometrial cancer and screening. Chinese J Clin Phys Electr 2011; 11: 189-187. Smid-Koopman E, Blok LJ, Chadha-Ajwani S. Gene expression profiles of human endometrial cancer samples using a c DNA-expression array technique: assessment of an analysis method. Br J Cancer 2013; 83: 246-251. Rui-xia G, Li W, Jian W. 17 beta estradiol for endometrial cancer cells phosphatidyl inositol 3 kinase/protein kinase B signaling pathways activated function. Chinese J Obstetr Gynecol 2014; 6: 469-473. Fang W, Gang Z, Fu-xian H. The ERK/MAPK signal pathways activated with invasive breast cancer cell growth. J Med Grad Students 2014; 6: 490-492. Milde-Langosch K, Bamberger AM, Rieck G. Expression and prognostic relevance of activated extracellular-regulated kinases (ERK1/2) in breast cance. Br J Cancer 2015; 92: 2206-2215. Mizumoto Y, Kyo S, Mori N, Sakaguchi J, Ohno S. Activation of ERK1/2 occurs independently of KRAS or BRAF status in endometrial cancer and is associated with favorable prognosis. Cancer Sci 2007; 98: 652-658. Bing C, Liu L, Xiao W. 32 examples of intrauterine membrane cancer gene expression profile of hierarchical cluster analysis. Cancer 2012; 26: 456-460. Friday BB, Adjei AA. Advances in targeting the Ras/Raf/MEK/Erk mitogen-activated protein kinase cascade with MEK inhibitors for cancer therapy. Clin Cancer Res 2008; 14: 342-346. Shu-qin W, Li-hua S, Li-hui W. Silk crack the original activated protein kinase pathway in the research development of gynecological tumors. Foreign Med Booklet Obstetr Gynaecol 2014; 31: 51-53. Xiao-ping W, Bing C, Ling L. Not in the same period dont differentially expressed genes in endometrial carcinoma tissue hierarchical clustering analysis. Chinese J Obstetr Gynecol 2013; 9: 38-42. Ferguson SE, Olshen AB, Viale A, Barakat RR, Boyd J. Stratification of intermediate-risk endometrial cancer patients into groups at high risk or low risk for recurrence based on tumor gene expression profiles. Clin Cancer Res 2005; 11: 2252-2257. Bidus MA, Risinger JI, Chandramouli GV. Prediction of lymph node metastasis in patients with endometrioid endometrial cancer using expression microarray. Clin Cancer Res 2012; 12: 83-88. Maxwell GL, Chandramouli GV, Dainty L. Microarray analysis of endometrial carcinomas and mixed mullerian tumors reveals distinct gene expression profiles associated with different histologic types of uterine cancer. Clin Cancer Res 2015; 11: 4056-4066. Risinger JI, Maxwell GL, Chandramouli GV. Microarray analysis reveals distinct gene expression profiles among different histologic types of endometrial cance. Cancer Res 2013; 63: 6-11. Huai-jun Z, Yi-fu S, Juan-qing L. A preliminary study on the gene expression patterns of endometrial adenocarcinoma. J cancer 2013; 25: 464-467. Yuan-guang M, Li-hui W, Jian-lu W. Application of DNA microarray technology c detection of gene expression profiles in endometrial carcinoma tissue changes. Chinese J Med 2012; 2012: 665-668. American College of Obstetricians and Gynecologists. ACOG practice bulletin, clinical management guidelines for obstetrician-gynecologists, number 65, August 2015: management of endometrial cancer. Obstet Gynecol 2015; 106: 1489-1495. Alizadeh AA, Eisen MB, Davis RE, Ma C, Lossos IS. Distinct types of diffuse large B-cell lymphoma identified by gene expression profiling. Nature 2000; 403: 503-511. Dan-dan S. Endometrial cancer androgen receptor expression and its correlation with, expression research D. Tianjin Med Univ 2012. Xiao-ping W. Endometrial carcinoma between estrogen receptor and MAPK signal pathway in regulation D. Shanghai Jiaotong Univ 2014.